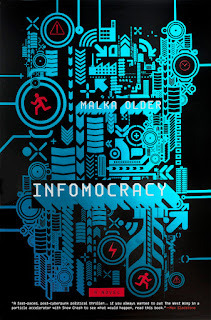 Malka Older was kind enough to spare some time for a Google Hangout session so we could chat about all things Dystopia. Shana DuBois (SD): Let's start with your basic concept/definition of a dystopia. I can make allowances for "utopian" and "dystopian" as being so tires that don't fully reach those states but kind of lean that way and certainly thinking about the terms in those kinds of absolutes somewhat limits their usefulness (because how many books/ideas really go that far, in either direction?) but for me the devaluation of the term dystopia in recent popular culture, where any future that is remotely authoritarian or has experienced any kind of mass disaster event is called a dystopia, is more problematic. Categorizing those scenarios as extreme and all but impossible future imaginings obscures the degree to which they are 1) easily imaginable results of the dynamics of where we are now and/or 2) occurring in some form (without the futuristic technology, with different names and locations, etc) in the present. SD: I like your distinction about utopias and dystopias being the static extreme ends of a spectrum and therefore connected. If we removed the limiting lens of those terms as they are commonly accepted today, how would that open up pop culture ideas, from a creation standpoint? Or do you think we're already too steeped in a preconceived, and limiting, concept when it comes to dystopian elements in media (books/movies/games/etc)? MO: I can only speak for myself, but I imagine those terms rarely come in at the creative process. I mean, maybe there are people out there who think, now I'm going to write a dystopia, but I think it's more common for a creator to have an issue of particular concern, or a terror of some specific outcome, and write it out. Those labels usually get put on in marketing (or reviews), so I worry more about their impact on consumers than on creators. Such distinctions serve a role in directing people to what they feel like reading (a cheerful future or less so, and that's a choice I respect and make all the time based on mood), but like I said they make it easier for people to distance themselves from the real implications of those works. SD: Excellent point regarding creator versus consumer and how/when the terms come into the mix. MO: They are also very broad terms, as the Kincaid essay in Nerds of a Feather notes. So, again on the critical side, there's room for a lot of interesting work about the *kinds* of so called dystopias (and, much less commonly, "utopias") we come up with. Some of that is already going on, but more recognized flexibility in the terms would be nice. SD: For work categorized as dystopian, or even utopian, what role does illusion, or a constructed reality, versus reality play? Is such a break required to reach those extreme ends? MO: The issue I see is that it is works of science fiction, or occasionally fantasy, that are categorized this way. If a fictional work set in the present (or the recent past) describes a horrible system, it is described as "realism" - which is pretty interesting, when you think about it. But add a few genetically modified birds and futuristic fashion and suddenly it's a made-up dystopia. Now, of course it's normal to take speculative fiction with a grain of salt, but for me the power of writing in a speculative way is that it gives us a different perspective with which to examine the here and now. 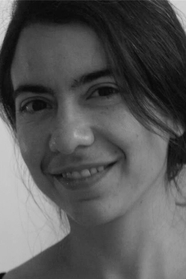 "Realism" in literary fiction can be very powerful, but it can also give readers a way to say "that specific person is not me, that specific country is not mine, how sad this is and how beautifully written. So, glad I'm not involved in this story." What we often hope for in speculative fiction is for readers to be enjoying (or horrified) by the story and suddenly have a realization, partway through, where they recognize themselves, and their lives, through the funhouse mirror: if this were different, if that were different, if I change the names, oh, she's talking about us. Of course, it doesn't always work, and I'm not arguing for speculative fiction to the exclusion of literary realism, rather that we need both, because people's brains and empathy mechanisms work in different ways. SD: Continuing that train of thought, how much does your background and experience with humanitarian aid/development come into play with your writing and the story growth? And the desire to create a connection between the reader and the world around them? MO: That is really important to me, maybe because I've had the experience so many times of being hired to go somewhere that I knew of only through stories - referring to the stories of news reports and the myths of common knowledge and connotations - getting there and finding that it is a reality like any other. When I was hired to go to Darfur, I was of course scared, because we're taught to be - of course, some very terrible things have happened there, but they have also happened in places we're not taught to be scared of - but I was confident enough to go because at that point I had enough friends in the business that I knew some people who had worked there. When I got there, and was in the place working next to people who lived there, for whom it was their daily life, it suddenly became real and much less frightening (I was briefly scared only a couple of times while I lived there, and all were because of misunderstandings). At the same time, though, it makes the terrible things that happened and happen there much more real to me, because they are no longer abstract terrible things happening in an already abstractly terrible place, but awful, unwarranted disruptions in ordinary lives of ordinary people, some of whom now happen to be my friends. That process, of moving from an abstract idea to something concrete and familiar and therefore meaningful, is what we'd like fiction to do: creating empathy and broadening our experience to places where we can't personally go. This is why I worry about the label dystopia; I think it makes it easier to continue to say this is not a real place, these are not things that really happen, they are impossible. Usually they are things that happen, at most slightly exaggerated or slightly adjusted. Even if the writing is effective at putting the reader in that place, the label can allow them to distance themselves again. 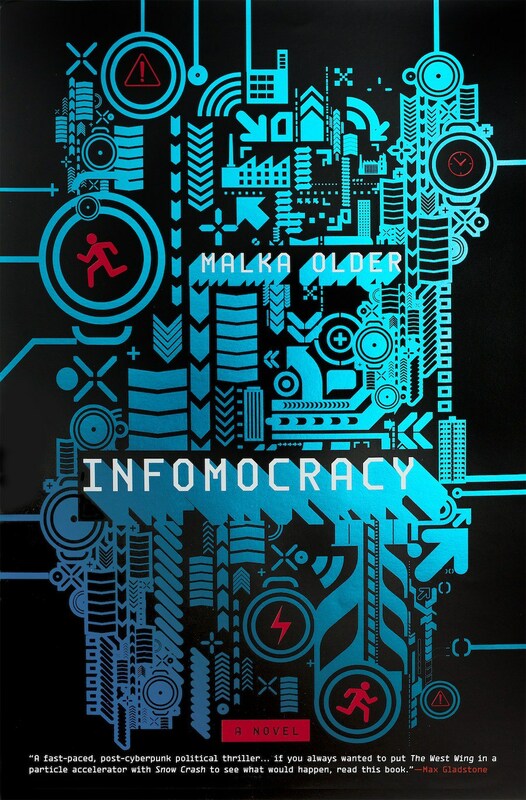 SD: What do you think about your debut novel, Infomocracy, often finding the label dystopia applied? The events in that novel don't feel terribly far-removed from the world we live in now and yet it is often discussed as a far-future and extreme possibility. MO: First I want to repeat what I said at the beginning, that I know my definition of dystopia is not the common usage; I'm not here to convince everyone that I'm right, you do you. Also, I'm perfectly fine with the idea that other people experience my novel in a different way than I do, in fact I think that's pretty awesome (and really interesting). So, I don't have a problem with people calling Infomocracy a dystopia. I do find it a little baffling, and fascinating, and I wonder why it has been so pervasive. After all, this is a book that's set about 50-60 years in the future that shows few signs of scarcity or impending apocalypse (there are some signs of climate change impacts, but nothing suggesting massive disaster), has some cool and effective new tech, and is not only mostly democratic, but mostly micro-democratic. So why is it so scary, why is it a future we would want to avoid? (I should note I'd be almost as baffled with people calling it a utopia. I didn't mean for it to be one or the other, but on balance I do see it as slightly more hopeful than not). I could be wrong about this, and I'd love to hear from people about it, but I suspect that it has a lot to do with the pervasive surveillance in this world, even though that surveillance is not in the service of a single government and almost all of it is available to be seen by anyone (so, very different from Big Brother-type surveillance). If that's the case, it opens up a really interesting discussion about real-world surveillance, not just by governments but by companies and individuals, and how far that is from what is described in the book, and how we get lulled into ignoring additional surveillance as it becomes normalized. Do people find it scary as a possible future, or as a slightly tweaked version of our present, in which companies follow where we go on our phones and track not only our purchases but our searches and there are cameras not only on the streets but on our most commonly used devices, pointing at us all the time? This brings me to something I found really interesting about Kincaid's essay. In that history of utopias and dystopias, there's a common element: order. The original utopia was, as Kincaid described it, about order: "it could be reached structurally: this perfection was not the province of god or of fairies or some supernatural inversion of the natural world, this perfection was achieved by rational men [...] For More [...]perfection was always equated with order. [...] within any society, order was what brought happiness." But the later dystopias are also about order achieved by rational men: about utter control and regimentation. This odd similarity in the dichotomy suggests something about how why these terms are so popular. They reflect our struggle with the (relatively new) concept of a government that creates order in our lives. Much of the recent history of political science and government is looking for ways for us to govern ourselves through rules and order that protect us from the worst of what humans are capable of. It's a paradox, because no number of rules can completely protect us from abuse or autocratic take-over; in fact, the more rules there are the more dangerous it becomes when the wrong person/people are in power. We try and try and try to rationalize and order everything, and yet there is always the human element in determining how it works - and in fact, dystopia tells us, it is when we succeed in exorcising the human element that we are in the most danger of oppression. So rather than a linear range, we're looking at more like a circle where at their edges, the extremes of utopia and dystopia are not so far apart. This is especially true because, except in the most perfect examples of these extremes, the experience is not the same for everyone. That's something else that tends to get flattened out by diluting the concept of dystopia: that in the modern concept they include a lot of inequality. For those people at the top, it's not a dystopia, it's closer to a utopia. Everything's working fine and ordered exactly the way they like it! That's an area that could use some more discussion in understanding what we're really afraid of. Also, that is related to a problem I have with Kincaid's essay. The Handmaid's Tale is not a *feminist* dystopia. Yes, it is feminist, but there's no need to qualify the label. For one thing, as I recall things were not so great for most men in that world either. It's like calling 1984 a worker's dystopia or something. SD: You brought up the power of the human element. In a lot of dystopias/utopias, we see a world where conformity has become a standard and individuality eroded. How does the disappearance of choice lead to the erasing of the individual thus leading to a dystopian/utopian environment? MO: Again, this is something that comes up in relation to Infomocracy. In fact, there's a scene in which Mishima wonders whether it is the idea of its many nameless bureaucratic workers that makes people uncomfortable about Information. Similarly, I wonder if people see some kind of uniformity in the book that makes them label it a dystopia, even though the basic idea is about offering more choice in a democracy. So interesting how one person's choice is another's tyranny. SD: Do you think this fascination with dystopian works is a very American, or Eurocentric, concept specifically because privileged developed countries view themselves as approaching utopian ideals and the rest of the globe as a dystopian existence? MO: I don't feel like I'm an expert on this, but my impression is yes, very much so. I've had conversations with people about, for example, The Hunger Games (which I loved, btw, speaking strictly about the books) and how I don't think it's a dystopia because it describes, with flourishes and fictionalization, things that have certainly happened throughout history and are happening to some degree RIGHT NOW in various places, and the answer comes back "well yes, but it's set in the United States, so part of the dystopia is linked to things going so badly that it happens here." First of all, the US is not so far off from many of the concepts in the book, and if there's anything we've learned from history it's that if it happens somewhere, it can happen anywhere (seriously, name me a country/region/people that hasn't committed "dystopia"-like atrocities in its history). Secondly, in my opinion, dystopias aren't about something bad having happened: they're about the systems that allow oppression and exploitation. If those systems exist somewhere, then this is not an extreme, impossible ideal: it's a commentary and a way of looking at the world we know. Also, and this is where I don't feel like an expert, I don't think the label is applied as readily to books that come from outside of US/Europe. Is it because we believe those places are already that bad? But I haven't done a comprehensive enough review of what has and hasn't been called a dystopia to say that with any certainty. SD: With resistance often being a large element within dystopian works why do you think we keep the application so narrow? For example, LotR is centered around a very focused resistance to what would be the end of the world as they know it and yet I've never seen it categorized as a dystopian work. MO: Well, the flip side of it is besides resistance, the oppression has to be somehow systematic, tied into government (I'm not sure when this became a part of the definition, but it does seem to be, and that distinguishes dystopian from, say, apocalyptic fiction). So, while Mordor presents a picture of what dystopia could look like in effect, the fact that it's created/managed/ruled via magic (or whatever you want to call it, elemental forces that are different from the ones in our world) it is harder to connect with it in that way. Which I think tells us something about what we are concerned about with these labels. But it is interesting that fantasies - I'm thinking of the Lion the Witch and the Wardrobe too, and many others - often take a very similar form: the way the bad magic is defeated is often similar to the way oppressive government is defeated, and the way it's used has the same effects, so there are some parallels there. And then you have the fantasies that don't involve magic per se (like Baru Cormorant) but do exist in other worlds, with different place names and customs, and those I think are unfairly excluded, because they often provide very sharp analysis of these mechanisms. Maybe that's why the Hunger Games feels like fantasy, because initially you don't know that it's set in a future United States: initially you are dealing with made-up names and a seemingly made-up place, with a future technology that's a little hard to distinguish from whimsical magic. It's a nicely done twist, actually. SD: How would you like to see either the definition and/or genre of dystopian/utopian works grow moving forward? MO: Honestly, I'd just like to see both words but especially "dystopian" used much more sparingly. I don't have any problem with the books they're used to describe; as I said, the labels usually come after the fact. I do think there might be some interesting work to be done in questioning and pulling apart some of the assumptions built into them, whether that work is done through fiction or through criticism. SD: Any additional parting thoughts you'd like to share with the NoaF readership? MO: Just to say again that even though I disagree with the broad application of the word dystopia, that phenomenon itself is really interesting and can tell us a lot about both literature and our society, so I'm glad NoaF is digging into it! I'd like to thank Malka for taking the time for such an engaging conversation!